Preheat the oven to 350°F. Cook the pasta according to the package directions. You'll want it to be al dente. (You'll need about 24 shells. I say this because some will be broken when you open the box and others will be damaged during cooking.) Drain them and rinse them in cool water. Set aside. Combine the chicken, spinach, cream cheese, Parmesan cheese, garlic, basil, and 1 cup of the mozzarella cheese in a large bowl. Spread about half of the pasta sauce in the bottom of a lightly greased 9x13-inch baking dish. Stuff the chicken filling into the shells. (I used a generous heaping tablespoon of filling in each one.) Then place the stuffed shells on top of the sauce in the baking dish. Pour the remaining sauce over the shells. Cover the dish (either with a lid or foil) and bake for 30 minutes. 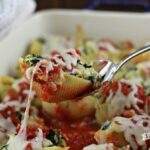 Remove the dish from the oven, remove the top, sprinkle the remaining mozzarella cheese over the shells. Return to the oven for about 5 minutes or until the cheese is melted.